Joyce is a Medical Support Assistant with Harry Meyering. She has been here for 8 ½ years. Starting as the morning TMA and taking the individuals on appointments, Joyce was then molded to fit the needs of the individuals. She focuses on their wants and needs while keeping in mind their health and safety. When asked why she chose a profession in the care giving industry, Joyce stated she enjoys making a person’s day better and helping them have a better life. The impact she makes on everyone’s life, everyday, is what Joyce likes most about her job. 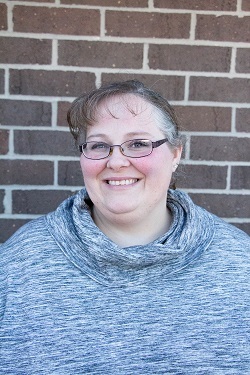 Joyce was born and raised in St. Peter, Minnesota and currently lives with her fiancé, two children and a cat. In her free time she enjoys painting with acrylic paints and spending time with her family and friends. She likes to stay organized at work, but not so much at home.